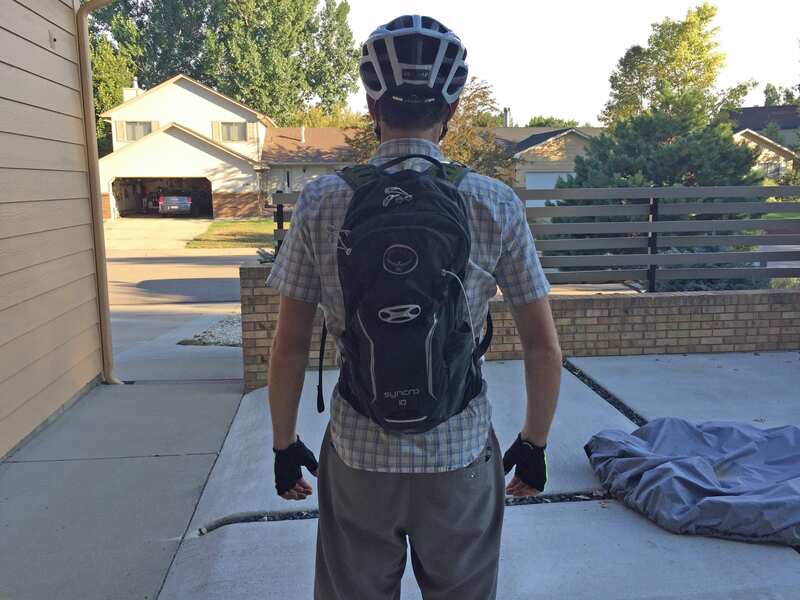 Clothing and bags are pretty personal in my opinion, everyone has a different body and style comes into play. 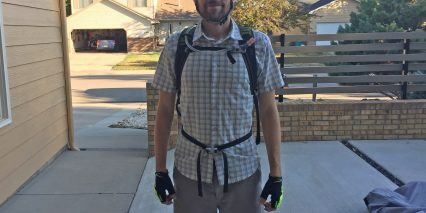 I feel like there are two approaches to cycling gear… go cheap and make it work or go expensive and scrutinize the details. 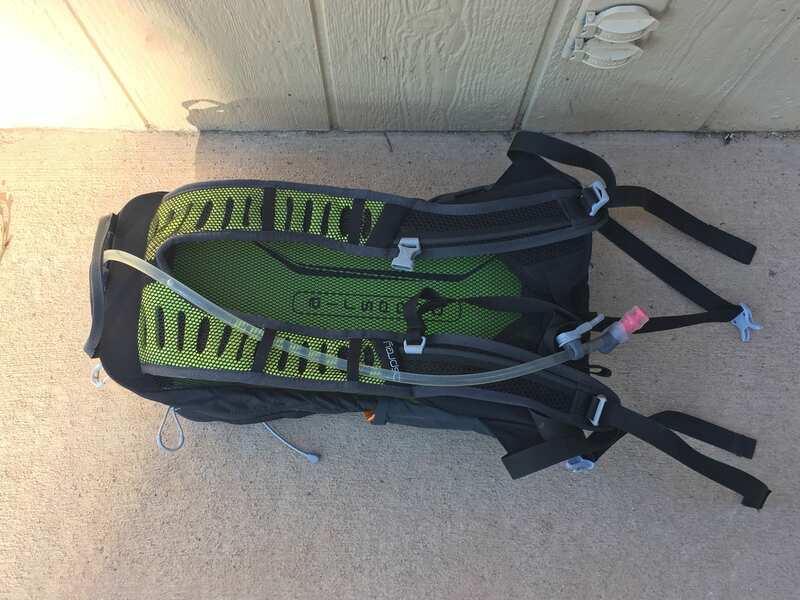 Well, I spent over a week searching online and trying hydration packs on in stores like REI before I finally settled on the Osprey Syncro 10. It won me over with color and size choices, a lifetime warranty and features that are so well thought out and useful I felt like I couldn’t pass them up. 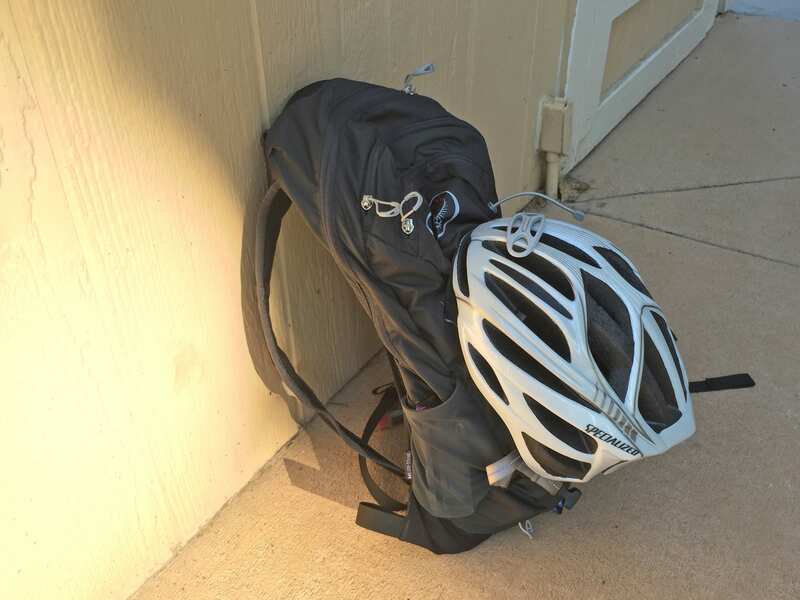 Features like reflective paint, a loop for attaching a reflector light, an brightly colored integrated rain cover with reflective paint and a second light loop! At $110 this is not a cheap bag but in many ways it’s like a purse and I know people who spend thousands on those! 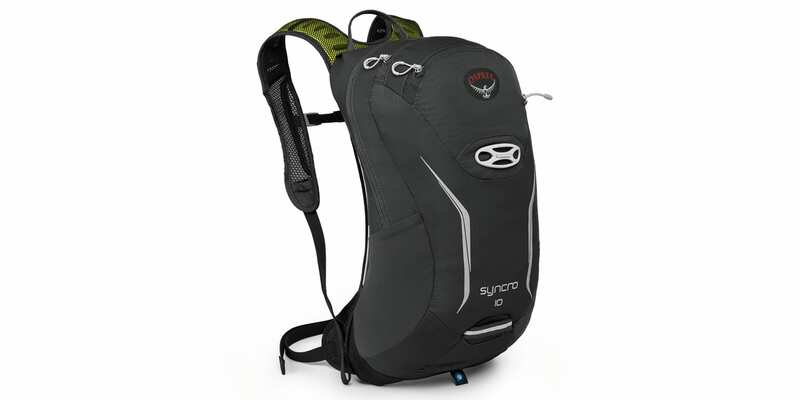 I could have bought five of these for roughly the same price and achieved most of the same surface goals: carry gear, bring water. 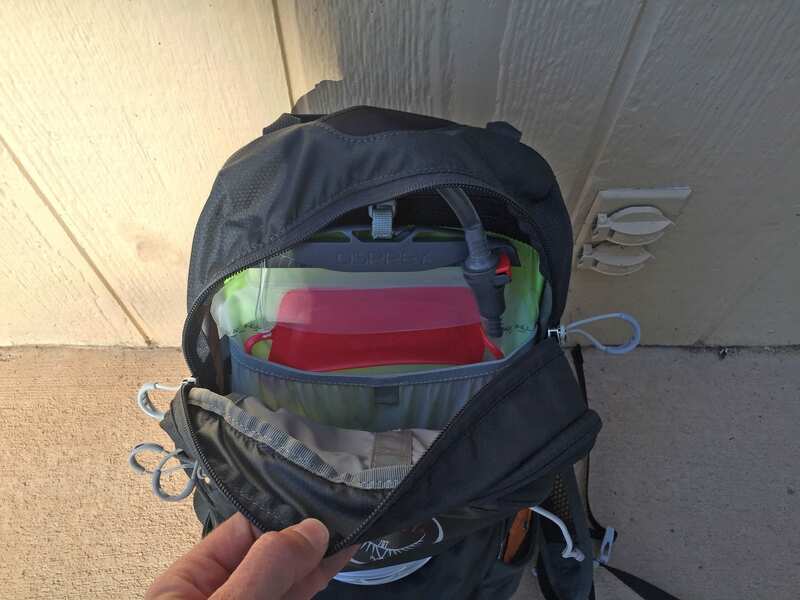 But after unscrewing the different lids on other hydration bladders and struggling to get them to thread properly… reading about leaking bladders in online reviews and simply testing for comfort the Osprey line proved its worth. 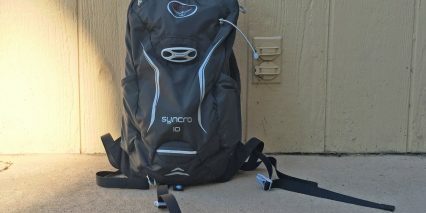 The most important thing to me was comfort but most packs feel roughly the same at first, I loved that I could choose an appropriate size for my torso with the Syncro 10 and I’m guessing some people with shorter torsos will appreciate not having a pack that sags way down or has to be cranked so high up that it collides with the back of their helmet. That’s the major difference in size by the way, the height of the pack. 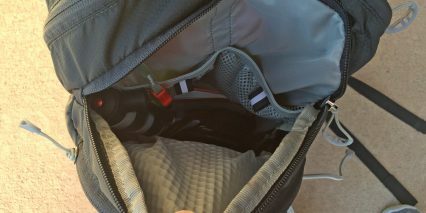 Inside the fabric is a metal rod that props it up and creates an open space between the fabric mesh resting on your back and the contents of your bag. 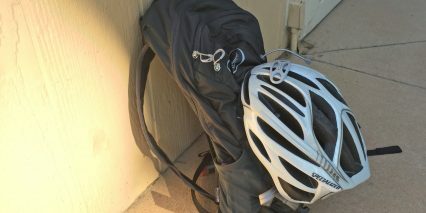 It’s a very cool design with the added benefit of spreading your gear out inside. You don’t end up with a big pile of junk bunched up at the bottom that’s difficult to search through. 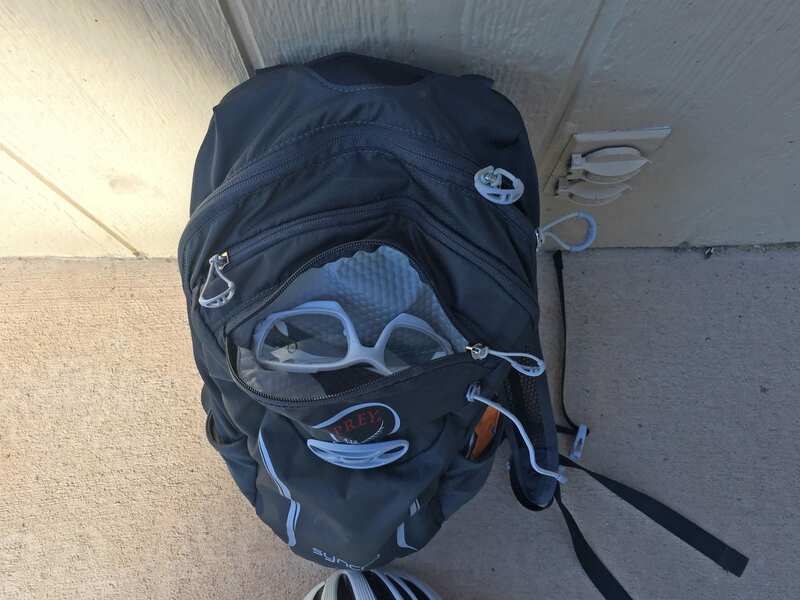 Instead, three compartments help you organize and separate abrasive heaving items like pumps and keys from sensitive light things like glasses. 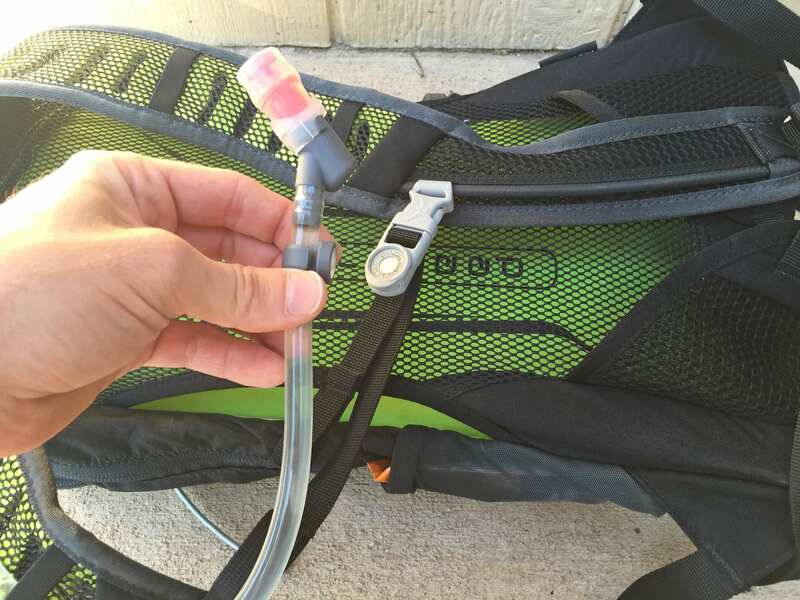 As alluded to earlier, one of the other important aspects of a hydration pack for me was how the water reservoir could be reached and used. The Syncro 10 makes it very easy to access thanks to long zippered sections with strings and finger loops on the zippers themselves (great for if you’re wearing gloves!) 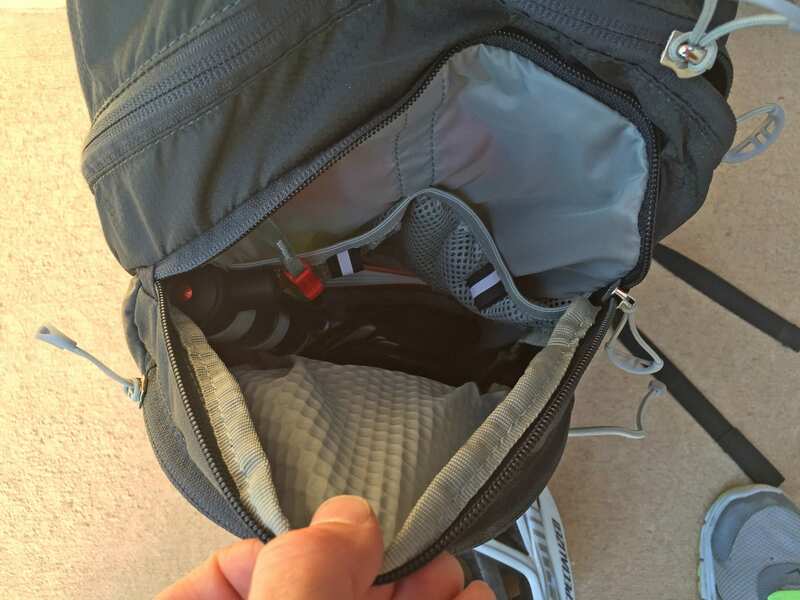 note that most sections on the pack have short zipper sections to help you avoid spilling and to sort of prop the interior up. The largest section where the bladder is opens further to make filling easy. Once you’re inside there’s a disconnect point on the straw and a tiny strap with a buckle actually holding up the water pouch. It compliments the metal frame design perfectly. 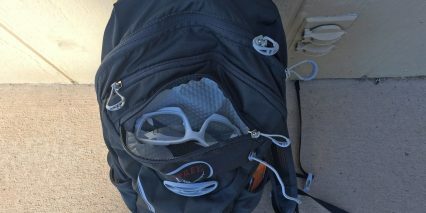 Once the pouch is out you slide a clip horizontally off the top and unfold the rubber opening. It reminds me of a dry bag often seen on rafting trips. The resulting opening is very large and easy to work with. 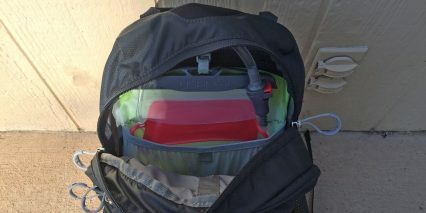 You can get water in there, big ice cubes or a cleaning brush if you’d like and holding the pouch is easy thanks to an integrated handle on the front. 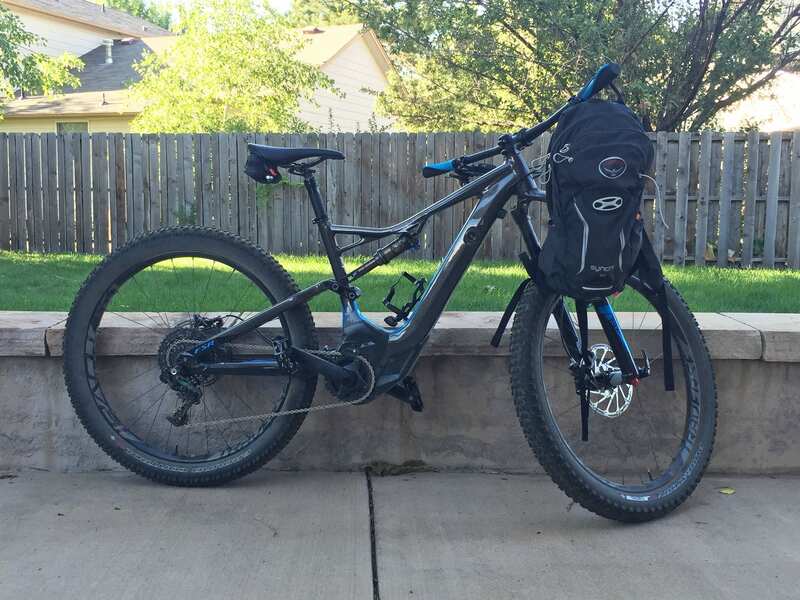 Watch the video review above to see it in action! 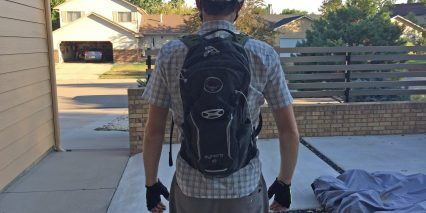 Having used the pack on many bike rides (on and off-road) I’ve come to appreciate just how convenient it is. 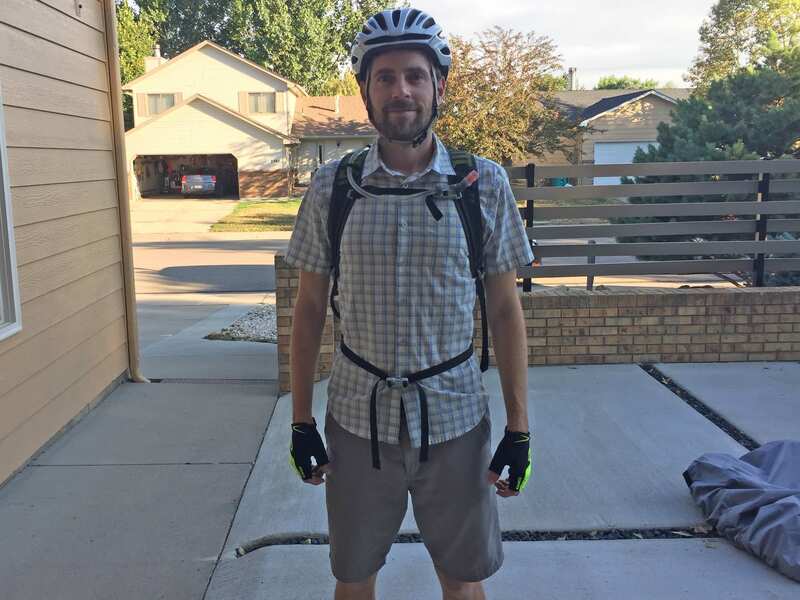 Before this I was using a thin single-pouch bag that didn’t have a hydration reservoir and I would toss water bottles, keys, cameras and other junk in there which did get a little bit scratched up and was often difficult to find. I had to take the entire pack off and set it down to locate the exact item in question. Now everything has its place, the bag is keeping me safer thanks to the reflective paint and I’m enjoying water at my finger tips. 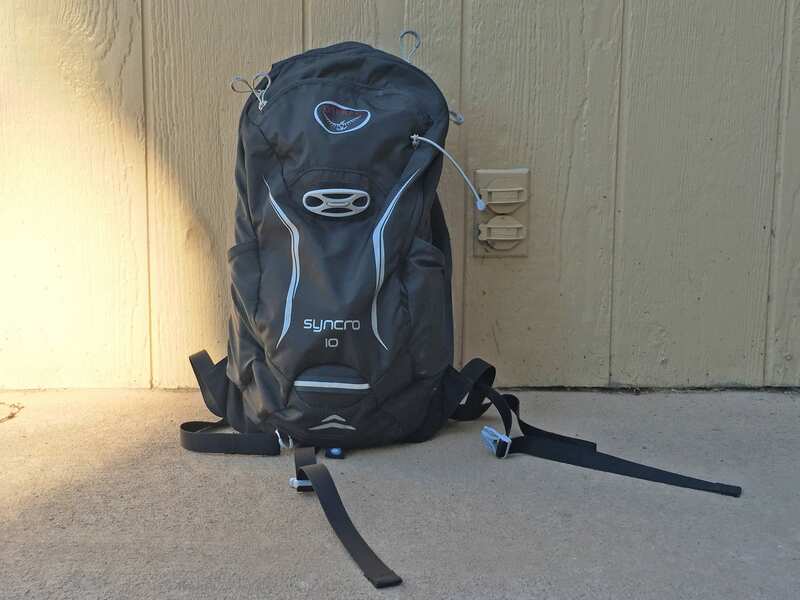 This is a solid pack for me but I’d still recommend checking them out in person because Osprey makes multiple versions like the Syncro 15 with a bit of extra space. 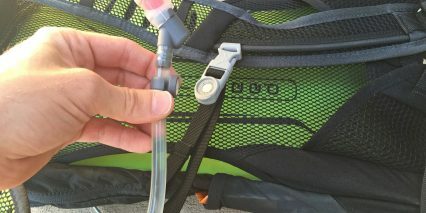 I’d love to see CamelBak and others adopt a similar reservoir lid system vs. their screw on design. 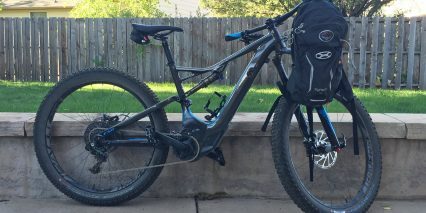 I struggled to get it working and even employees at REI had a difficult time. Had their system been more like Osprey I would have had a more difficult time choosing. 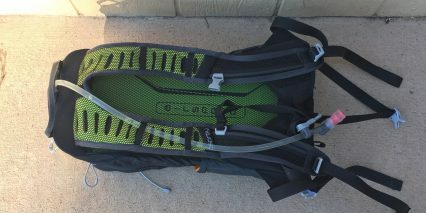 $82 at REI Garage, perhaps still no bargain.